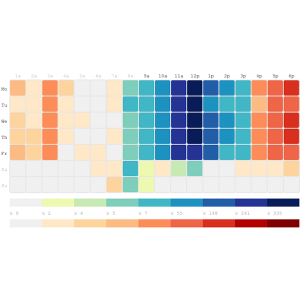 Heat maps represent values in a matrix as colors. Traditionally, heat maps have been used to indicate the level of activity in different systems. For example, a load test result can represent requests to different parts of the application as a heat map. The heat map appears as a mass of colors chosen from a color scheme with gradients from one color to the other. 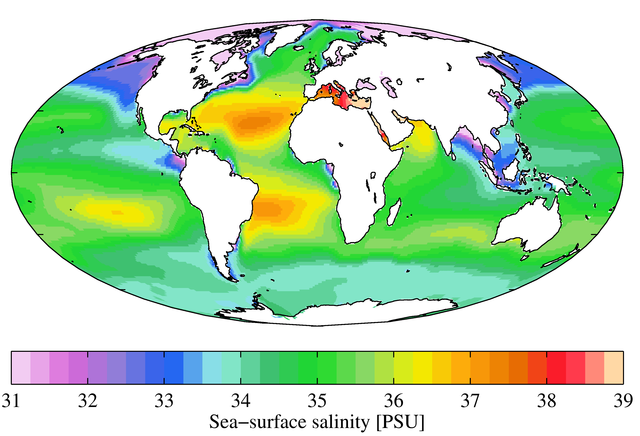 Above is a geographical heat map of ocean salinity using a rainbow colormap. Another interesting use of heat maps is to understand the degree of relationship between two variables. This results in a grid where the axes are obtained from the range of each variable. The rest of this post describes the usage of grid heat maps in different scenarios. This visualization, taken from Trulia’s trends, depicts the degree to which the day of the week and the time of the day are correlated for house hunting. The full visualization suggests that most house hunting is done on weekdays at 9PM and Sunday evenings. A web application’s logs can be analyzed to understand the usage patterns. If you take the day of the week on the y-axis and the time of the day in the x-axis, the grid color can be determined by the number of requests or by user sessions, measured over a period of time. The grid heat maps are not limited to time units on both axis. The next three examples show usage in other domains. In a recent project, I proposed a prediction model that analyzed weather trends and advised on the inventory for perishable items for each day of the week. In order to depict this, I plotted the items (categorized as A, B, C…) on the x-axis and the day of the week (Mon, Tue…) on the y-axis. The grid color was influenced by the amount of inventory to maintain for a particular item and day. The resulting visualization was quite similar to the web usage example. A correlation matrix denotes the correlation coefficients between variables at the same time. A heat map grid can be used to represent these coefficients to build a visual representation of the dependence between the variables. This makes it easy to spot the strong dependencies. A positive correlation indicates a strong dependency while a negative correlation indicates a strong inverse dependency; a correlation coefficient closer to zero indicates weak dependency. The data source is mtcars data set from R development environment. It comprises of different aspects of automobile design and performance for 32 automobiles. 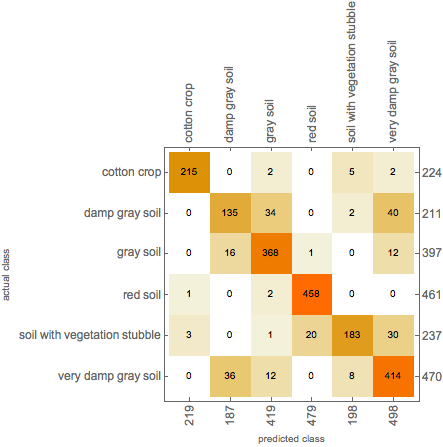 You can refer to the data set to understand the variables used in the correlation matrix. In the matrix, the blue circles indicate positive correlation, while red circles indicate negative correlation. A confusion matrix is a table that is used to denote the performance of a classifier on test data for which the true labels are known. 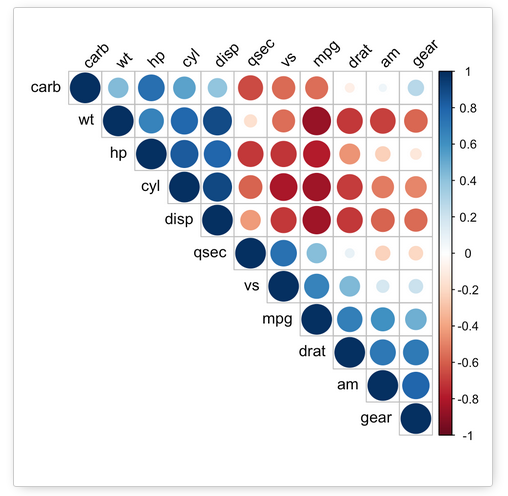 A typical confusion matrix looks quite like a correlation matrix, except the cells denote the number of times an event (from the test data) was mislabelled. A grid heat map can quickly show the degree of confusion. This data set represents classification of images taken by satellites. The type of satellite image is a function of the image features. Can you tell which are the most mislabelled images? Enough of examples. Let us understand how to build a grid heat map with a faux problem (but real data!). You are the operations head in an organization and you are health conscious. You want to provide fresh fruits to employees because you are concerned that they keep snacking on unhealthy choices. In order to do that, you want to time the shelf stocking (when do the fruits come out and when do they go in). One way for you to time the activities is when most employees clock in and when they clock out. Each record denotes the day of the week, in-time in 24-hour clock format and out-time in 24-hour clock format. The next step is to read each record and bin the in and out times in a matrix with hours-of-the-day as the x-axis and day-of-week as the y-axis. For example, the record shown above will increase the count in (Mon, 10), (Tue, 9), (Wed, 10) cells of the in-matrix and (Mon, 18), (Tue, 18), (Wed, 18) of the out-matrix. Isn’t it easy to spot that everyone comes in only after 8 AM and most people leave by 9 PM? So, now you know when to put fresh fruits on the table and when to put them away. Write to us or leave us a comment if you think this can help you with a business case.